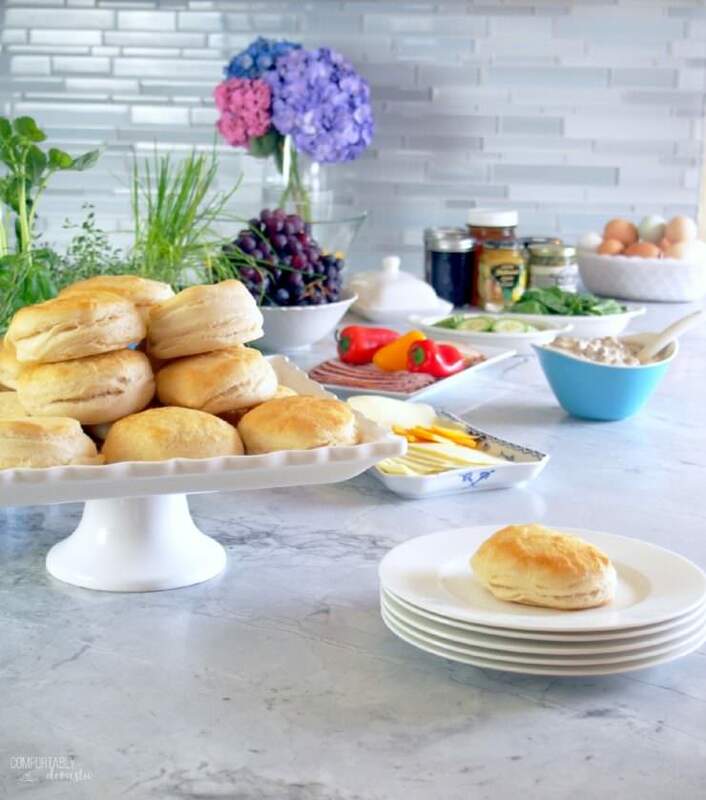 Hosting a Biscuit Bar Brunch makes it both easy and delicious to entertain and feed a crowd. Eating breakfast is required for good health and sustained energy throughout the day. 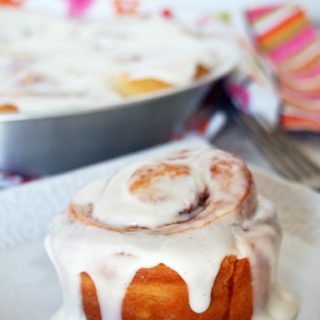 For me, skipping breakfast results in a day filled with poor food choices and a whole lot of regret. Skipping breakfast will invariably lead me to eat a fat slice of vanilla buttermilk cake with a tall glass of milk for lunch, which would likely lead to making soft batch chocolate chip cookies for a snack, and then eating All the Things from about 3:00 p.m. onward. It’s not pretty, friends. So breakfast? Totally necessary. I’ve never been one of those tea-and-toast kind of morning people. I’m more of a pile-the-chow-on-the-plate kind of morning person. Breakfast would be my favorite meal of the day if only it didn’t require that I think so dang early in the morning. I need a few hours to wake up before I’m fit to be around polite company. Now when breakfast comes a little later in the morning, say just before lunch time? That’s more my speed. Because brunch is my favorite. Brunch is my jam! We should all know that Brunch is the perfect balance of breakfast and lunch foods served all at once. You take the best of breakfast with the best of lunch and huzzah! Brunch is on the table. Since today is Mother’s Day, I was able to sleep in a bit and wake to a delicious brunch prepared by my fellas. Any meal that I don’t have to prepare myself is a luxury in and of itself, amiright? One of my favorite brunch style meals revolves around hot buttermilk biscuits and this lightened up sausage gravy. 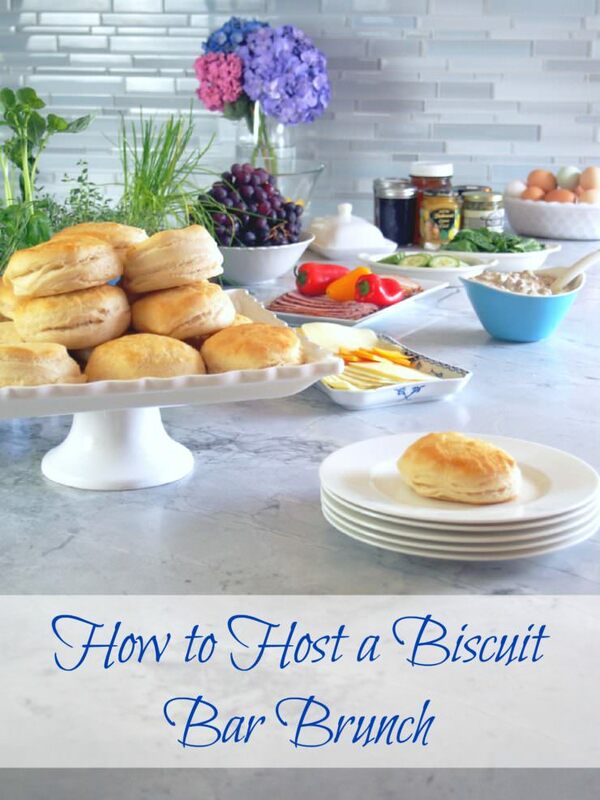 My girls Jeanne and Kat have made hosting a Biscuit Bar Brunch a true art form, so I’m sharing their great ideas with a few of my own to show you How to Host a Biscuit Bar Brunch. I think hosting a brunch is a great way to get involve guests in tailoring the menu to suit their own tastes. Not everyone cares for a sea of egg casseroles, but I’ve yet to meet anyone that didn’t get excited about a big pile of biscuits. 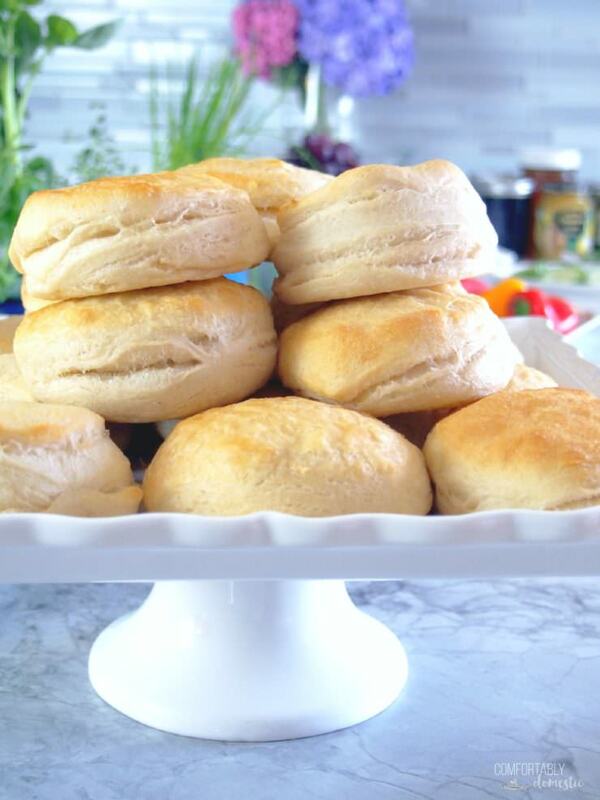 First, start with some really great biscuits, as they are the basis for everything else served at the brunch. I prefer to make my own biscuits a day or two ahead of time, but the whole point of doing a Biscuit Bar Brunch is to keep it simple. If that means using a box mix, buying biscuits from a bakery, or cracking open a few cans of refrigerator biscuits and baking them the day of, then that’s completely up to you. Live your truth and don’t stress about the biscuits. Whichever route you take, I suggest making more biscuits for each guest than you think that you’ll actually need. There’s just something about having a potpurri of toppings available that inspires people to go back again and again to create different biscuit combinations. If I think that each guest might eat two biscuits under normal circumstances, then I’ll be sure to have 3 to 4 biscuits per guest for a Biscuit Bar. 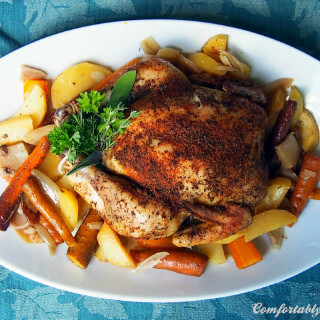 Next up, gather a load of savory options for those that might like lunch type fare. I like to set out lighter sausage gravy and a couple of types of meat–in this case, sliced oven roasted turkey and pepper crusted ham. A variety of sliced cheeses, select vegetable toppings, additional protein choices such as hard boiled eggs, and a few favorite condiments will give guests a variety of options to build a savory biscuit sandwich. 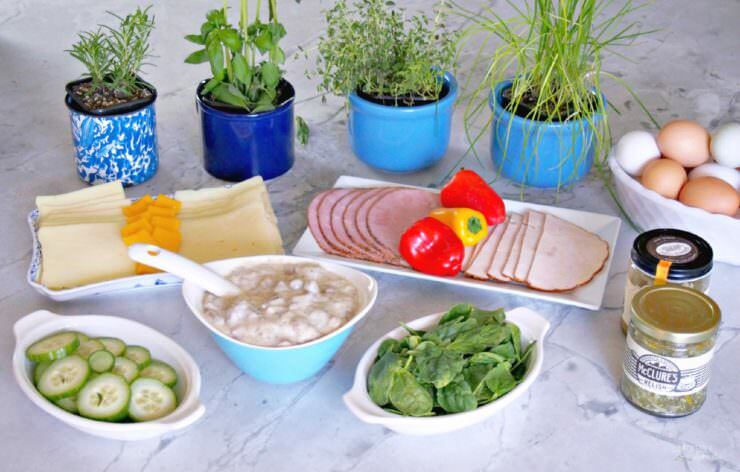 I also like to decorate the buffet area with small pots of fresh herbs, and encourage guests to pinch off a few leaves to add even more flavor to the biscuit sammies. For a simple decorative touch, set the little pots into large mugs or bowls to camouflage the plastic pots. I was able to score the herbs in the photo from the produce section at the local market for 99 cents a pop. Talk about cheap and functional decor! Once satisfying the savory first course, cap off the meal with something sweet by offering an assortment of fruit spreads such as strawberry basil jam, lemon curd, and perhaps some local honey to top off the biscuits. 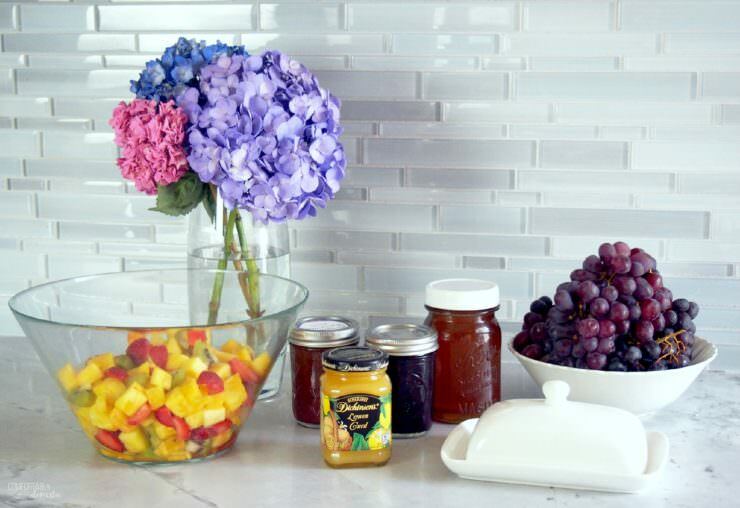 Serving a fresh fruit salad or other easily edible fruit gives guests dessert type choices that complement the rest of the meal without being too heavy or cloying. Hosting a Biscuit Bar Brunch is a simple, delightful way to satisfy every palate in the crowd. Biscuit Bar Brunch is also a nice way to break the ice and actively involve guests in customizing the menu to suit their own tastes. Biscuit Bar Brunch is absolutely perfect for Mother’s Day, bridal showers, and baby showers. The varieties are endless so have fun with it! So pretty and such great ideas! I’m ready for a biscuit bar brunch! ? How much do I love that this is a blog post?!? Girlfriend, I knew that you would! You are Queen of the Biscuit Bar!